In a previous paper (Lu et al., Mechanics of Time-Dependent Materials, 7, 2003, 189–207), we described methods to measure the creep compliance of polymers using Berkovich and spherical indenters by nanoindentation. However, the relaxation modulus is often needed in stress and deformation analysis. It has been well known that the interconversion between creep compliance and relaxation function presents an ill-posed problem, so that converting the creep compliance function to the relaxation function cannot always give accurate results, especially considering that the creep data at short times in nanoindentation are often not reliable, and the overall nanoindentation time is short, typically a few hundred seconds. In this paper, we present methods to measure Young’s relaxation functions directly using nanoindentation. A constant-rate displacement loading history is usually used in nanoindentations. Using viscoelastic contact mechanics, Young’s relaxation modulus is extracted using nanoindentation load-displacement data. 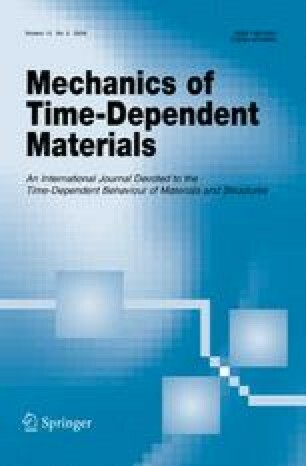 Three bulk polymers, Polymethyl Methacrylate (PMMA), Polycarbonate (PC) and Polyurethane (PU), are used in this study. The Young’s relaxation functions measured from the nanoindentation are compared with data measured from conventional tensile and shear tests to evaluate the precision of the methods. A reasonably good agreement has been reached for all these materials for indentation depth higher than a certain value, providing reassurance for these methods for measuring relaxation functions.